The Passion of Christ has long been a subject for artists. The material has depth of story and emotion like nothing other. Some of the most beautiful art that has ever been produced has used the subject of Christ’s suffering and death as inspiration. In the world of music there is the genre of the Passion chorale, in drama, the Passion play, and in art the standard canon of scenes from Jesus’ suffering and death as depicted in the Gospels. Behold the man. Ecce homo. the full gravity of this moment in all its awful enormity. But there is one painting that is different, and it happens to be one of the most famous of this genre. 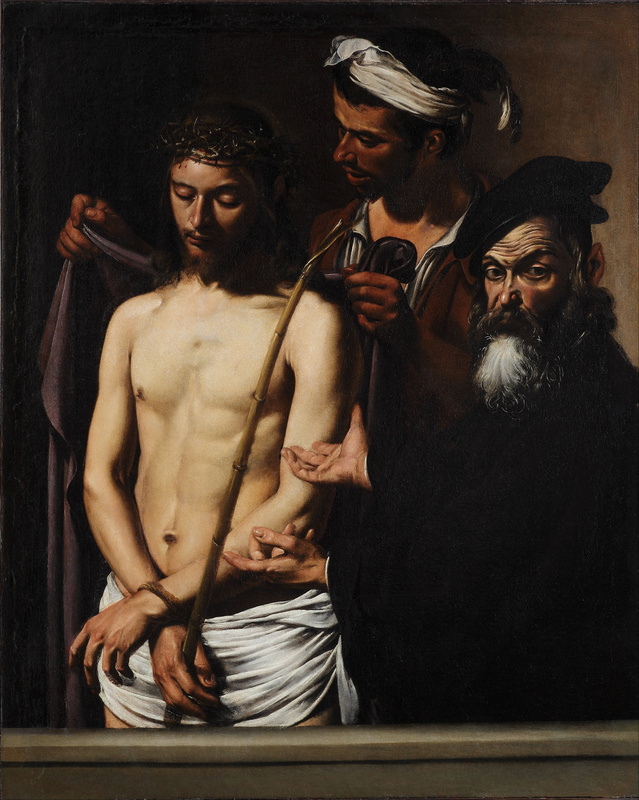 In Caravaggio’s rendition, there are no crowds, no surrounding city, no buildings or architecture, there is nothing at all, but the torturer, Jesus, Pilate, and you. Now, this was revolutionary because the depictions of Ecce homo that preceded Caravaggio serve to make you empathize with the suffering Christ and to be angry with those who caused his suffering. The torturer is shown with an insane look in his eyes. The soldiers are blood thirsty. The crowds are enraged. You are supposed to be angry at them. But in Caravaggio’s painting, the torturer almost doesn’t even want to be there, Pilate seems indifferent and annoyed, and the only person to blame for the horrible state of Christ’s suffering and humiliation is the only other person left in the artistic moment: me. I think Caravaggio gets it right. You see, Pilate is not saying Ecce homo to the scribes, the Pharisees, the chief priests and rulers of Israel. Pilate is saying Ecce homo to you, to me. He is saying to us, “behold the man.” Pilate is asking us what we will do with this Christ, this King of the Jews. He is saying to us, “Behold the man.” Behold him. Behold this Christ. There is something about considering Christ in this specific moment, almost as if we had hit pause on our TV remote. Here is Christ. Before he dies on the cross, yet in the midst of his suffering and rejection. This is a part of Christ’s passion, you see. This is a part of his atonement. He had to experience this moment. Behold the man. describe the scourging of Jesus. One word emphasizes the many pronged whip that was used, with bones and metal tied to the tips of the leather thongs. These thongs sliced through his flesh. The other word used in the gospels is the word that we get our word for “to chew” and emphasizes how the whip tore and chewed through his flesh. This scourging was for the purposes of torture, and the Romans were very good at it. Its goal was to inflict excruciating pain but still leave the subject alive so that he could be crucified. If this scourging itself would not have been limited, that act itself would have killed him. Behold the man. Behold him as the Roman soldiers take thorns and twist them and make them into a crown of mockery. Behold him as they cruelly force the thorny crown onto his brow. Behold the blood as it begins to pour. Behold the man. Behold him as the soldiers mock him and strike him. Behold him as they take a purple robe and place it on him, mocking his supposed kingship. Behold him as he is mocked and beaten by the very ones whom he carefully and wonderfully knitted together in their mothers’ wombs. Behold the man. Behold him now as he is brought out again before you. Behold him as Pilate presents him to you again. Behold him stricken, smitten, and afflicted. Behold the sacred head now wounded, with grief and shame weighed down. Behold him despised and rejected. Behold him acquainted with grief. Behold the man. it is our sin that put him there. We cannot look because it is our penalty that he is suffering to pay. We cannot look because it is we who have condemned him. Yes, when Pilate looks at us and says, “Behold the man,” we would like to think that we would grant him reprieve. We would like to think that we would take Barabbas instead. But no one has ever taken Barabbas. We have all taken Jesus. We have all condemned him to die. When did we do this? Every time we sin. Every time we reject goodness of the creator for our own selfish ways. Every time we follow the wicked ways of this world instead of the ways of God we are asking for Barabbas and rejecting Jesus. Every time we harden our hearts and do what we know is wrong, we are saying, “Away with him! Away with him! Crucify him! Crucify him!” Behold the man. own blood. Be healed with the stripes of his back. Be renewed with the blood of his brow. What will you do? What will you choose? This the most important decision you will ever make. Will you choose Christ, or will you choose to continue to wallow in your sin and misery? Will you choose Christ or will you choose death? There is no need for you to die because Christ has died so that you all might live. Choose life. Choose Christ. Was Jesus Crucified on the Mount of Olives? I must admit, this suggestion makes a lot of sense and resonates with me. The Mount of Olives figures largely in all the gospels and it’s theological symbolism can easily be articulated due to the significance of olives in the Bible. Many of our modern day designations for places of Jesus’ life are admittedly guesses by scholars, so this suggestion by Jordan is not treading on anything sacrosanct. I must say that given the geography and symbolism it makes a lot of sense. What think ye?